Unfortunately, we're unable to take donations for this appeal at this time. We have many other campaigns though, all equally in need of your kind support. In 2019, Qurbani is expected to fall on or around 11th August, although the exact date is subject to sighting of the moon. Donate qurbani with Al Mustafa Welfare Trust and help a family in need enjoy the festival of Eid-ul-Adha in comfort, too. Qurbani 2019 is almost upon us, which means that soon, Muslim’s all around the world will be celebrating Eid-ul-Adha with their family, friends and loved ones. Qurbani is the act of sacrificing an animal – usually a goat, sheep, cow or camel) on Eid-ul-Adha, following Eid prayers. The act commemorates the sacrifice that Prophet Ibrahim was ready to make to show his dedication to Allah (SWT). According to the narration in the Holy Qur’an, Prophet Ibrahim (A.S) had a dream - not once, but several times - where he was being asked by Allah (SWT) to sacrifice his beloved son. On narrating this dream to his son, Ismail, both father and son agreed to abide by Allah’s (SWT) wishes without any hesitation. Prophet Ibrahim (A.S) took his son Hazrat Ismail (A.S) to Mount Arafat to perform the sacrifice. Just as he was about to sacrifice his son, Allah (SWT) replaced Ismail with a dead ram instead. His son was standing next to him, fit and healthy. Today, Qurbani acts as a means of Muslim’s connecting with the sacrifice that Prophet Ibrahim (A.S) had to make. We celebrate Eid-ul-Adha to recognise the selflessness of both Ibrahim and Ismail and their unconditional obedience to Allah’s holy will. Truly an enduring example of the meaning of Islam, Ibrahim and Ismail submitted in the purest way possible. This celebration occurs within the last month of the Islamic calendar – Dhul Hijah, between the 10th and 12th day of the month. Qurbani is to be performed on the actual day of Eid-ul-Adha. The sacrificed animal can either be a goat (at least one-year-old), a sheep (at least six months old), a bull, cow or buffalo (two years old minimum), or a camel (five years old minimum). The animal should have no injuries, or broken bones, including its horns. The animal should be sacrificed either immediately after Eid-ul-Adha prayers or as close to then as possible. If the Qurbani donation is a goat or sheep, it is enough just for one person; but a camel, cow, bull, or buffalo can be a donation from as many as seven people. The meat of a Qurbani donation is divided into three parts; one to be shared out among the family, friends or neighbours, one for yourself and one to be given to those in need. Those who donate Qurbani give the Ummah a truly great and divinely inspired gift. 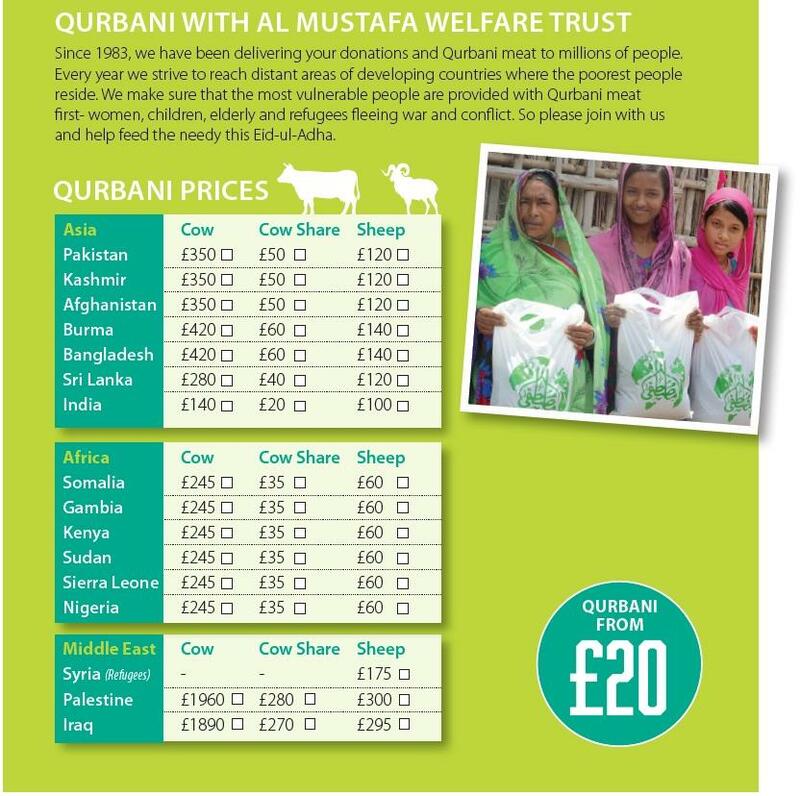 Donate Qurbani 2019 with Al Mustafa Welfare Trust today. More questions? View our Qurbani FAQ's page.